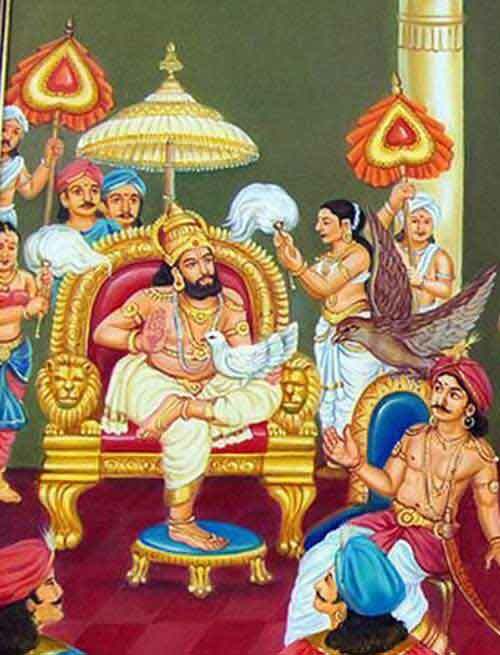 The story of King Shibi and the two birds is found in the Mahabharata. The story was narrated to the Pandavas by Sage Markandeya. The Pandavas listened to the story during their exile period. King Shibi belonged to the lunar race and was a royal sage famous for his spirit of sacrifice. The fame of King Shibi reached the heaven and as usual Indra, the king of Devas, was jealous. Agni, the fire god, and Indra wanted to test the genuineness of his self sacrifice. Agni took the form of a dove and Indra took the form of a hawk. The dove, chased by the hawk, fell on the lap of King Shibi and the king immediately took it under his care. The hawk insisted on the dove being passed on to it, as doves were the natural food of hawks. After much discussion, the hawk agreed to accept Shibi’s flesh, equal in weight to the dove’s. Shibi cut his body, limb by limb, and placed the pieces on one pan of the scale against the dove, which was placed on the other pan. But the flesh was not enough as the dove always weighed more. Finally, the king had no alternative but to sit on the pan himself. When the king did so, the two pans weighed equally and the scale stood balanced. Then the dove and the hawk revealed themselves as Agni and Indra to Shibi. They expressed their wonder at Shibi offering his body as a prey to a hawk. They appreciated the sense of justice and magnanimity of Shibi and blessed him. All the wounds of King Shibi got healed and he became brighter and stronger than before.